If you're looking for a simple to prepare but knock their socks off Mother's Day lunch or dinner may I offer you this lovely spread? I paired a roasted garlic and herb baked snapper with a simple but divine chive and sorrel cream sauce. 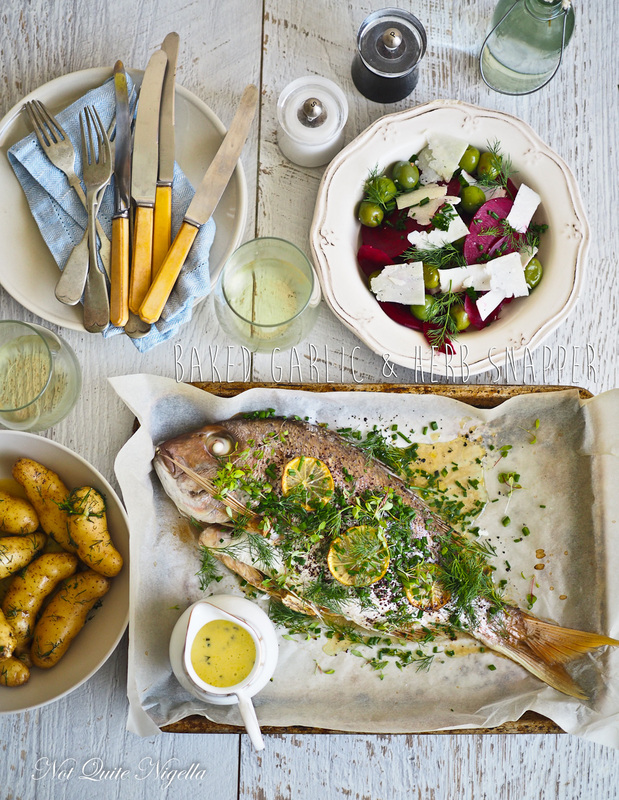 To accompany the fish are dill buttered kipfler potatoes and a crunchy raw beetroot, olive and goats cheese salad. I promise Dear Reader that this whole Mother's Day Feast will not take you more than 40 minutes preparation and cooking-I know because I tested it out and timed it. Fish is one of the easiest things to cook and this is a super easy preparation as I find that simple is best for fish. 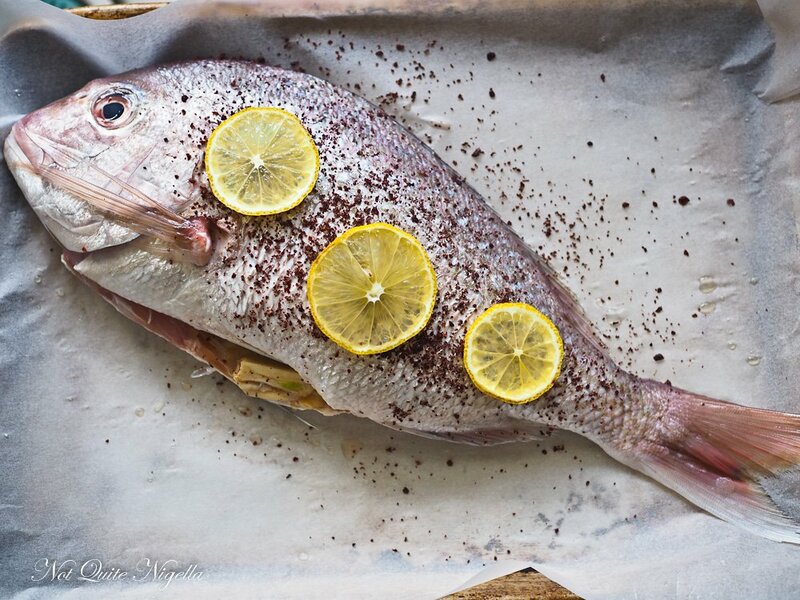 Snapper is one of the best fish to eat whole as the bones are large and easy to find. And dare I say but this whole menu is really quite on the healthy side which means...room for cake! Mothers can have such funny quirks. I think it's easy to forget that they had a fun life before you came along and that they may have been just like you. I was chatting to a friend (who shall remain nameless) who told me about her mother. It turns out that her mother had started to write romance novels. And when I say romance novels, I mean steamy romance novels. Her mother passed the unpublished novels on to my friend to read. To her slight alarm and embarrassment, she found that she and her two siblings each had a novel where they played the central character. She told me the name of one of them about her sister who is a scientist. It was called what else but "Love in a lab"! So tell me Dear Reader, are you making anything special this Mother's Day? How often do you cook fish? Do you like whole fish or do you prefer fillets? And was your mother like you once upon a time or now? Step 1 - First put the potatoes on to boil in a pot of water as they will take about 20 minutes to cook. Step 2 - Then preheat the oven to 200C/400F and line a baking tray with parchment. Wash the snapper and place on the tray, then score three slashes across the skin. Rub a cut clove of garlic all over the skin of the fish and then stuff the fish with the rest of the garlic. Sprinkle with sumac, top with lemon slices and drizzle oil on top. Roast the fish for 20 minutes. Step 3 - While the fish is cooking and the potatoes are boiling, make the sorrel and chive sauce. Heat the cream and white wine to boil and add the chives and sorrel and simmer for 10 minutes until it has thickened and reduced. Season with salt and pepper and place in a gravy boat. Step 4 - Then make the beetroot salad. Take a mandolin or sharp knife and slice the beetroot as thinly as possible. 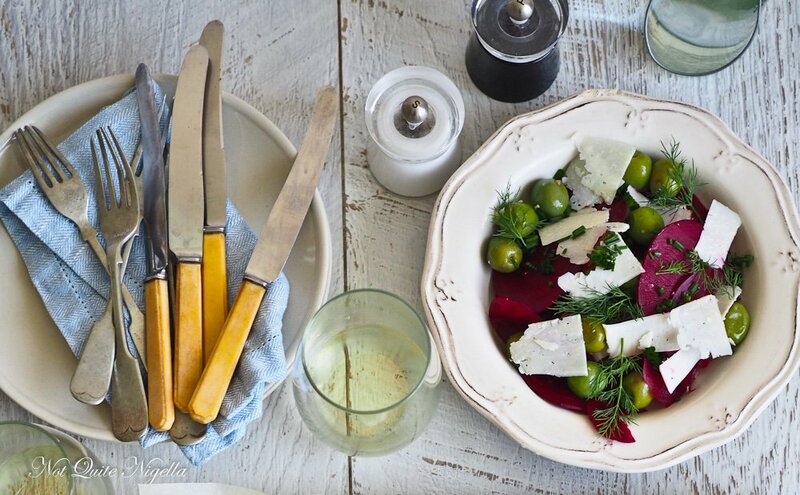 Place in a bowl with the green olives and shave the goat's cheese on top. I didn't dress this but you could certain make a simple dressing with olive oil and the juice from the remaining half of the lemon or a caramelised balsamic vinegar. Step 5 - By now the potatoes should be boiled. Drain the water and pop the butter and dill in the saucepan and allow the butter to melt. 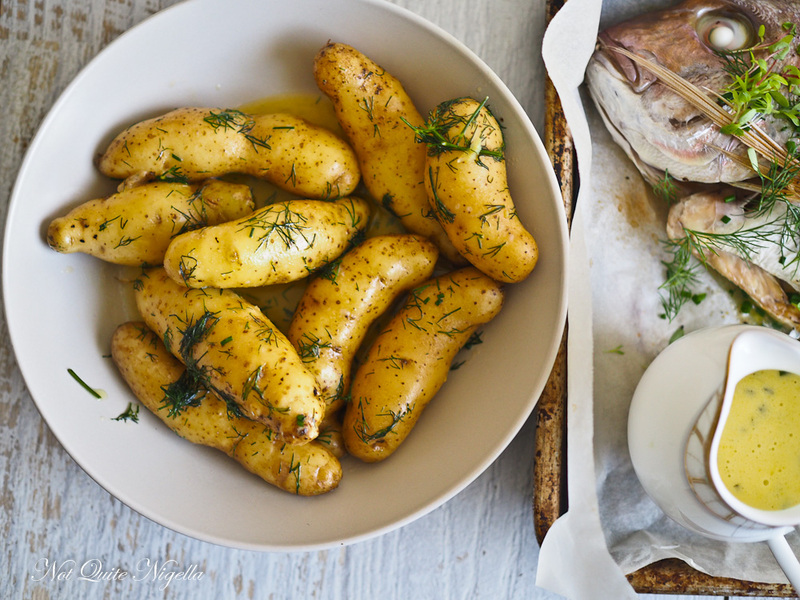 Toss gently so that the potatoes are covered in the dill butter and season with salt. Step 6 - The fish should be ready. Simply top with the fresh herbs and a sprinkling of salt and pepper. Serve with the sauce, potatoes and beetroot salad. recipeLooking Sharp: Razor Clams in 5 Minutes! recipeFood Hack: Homemade Everything But the Bagel Seasoning Mix! recipe Looking Sharp: Razor Clams in 5 Minutes! recipe Food Hack: Homemade Everything But the Bagel Seasoning Mix!